Oval LED Strobe. High Power. Clear lens with red light output. 3 bursts approx. every 3/4 of a second. 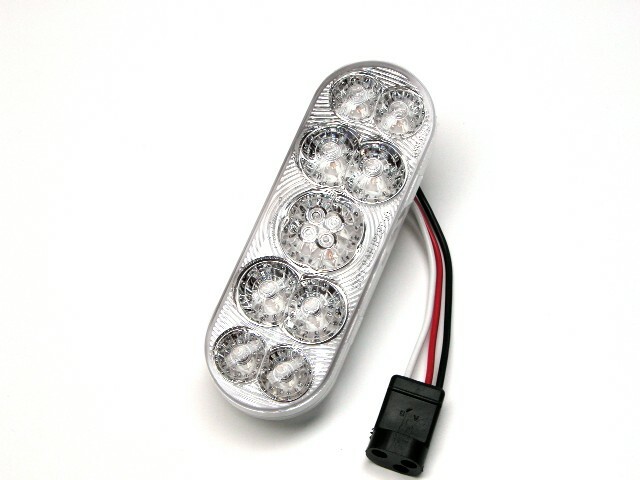 These strobes are physically a direct replacement for American Superlite 8200 series lights and most other commerial oval stop/turn/tail lights. - Ultrasonically sealed polycarbonate lens and housing. - Operating range 12-38 volts. - Patented reflector and optical lens enables 180 degree viewing angle. - Meets both DOT and ECE "E" photometric requirements. - Isolated standard plug and wiring eliminates connector corrosion at the housing. - High quality, MADE IN USA. This product was added to our catalog on Friday 18 August, 2006.